India’s capability to grow in a carbon-scarce world will determine the fate of the Sustainable Development Goals. The challenge of meeting the UN Sustainable Development Goals, particularly ensuring affordable and clean energy, continues to vex much of the developing world. Obstacles such as offtake risk—the risk of a power producer not getting paid for its power output on time—underdeveloped financial markets, and perceived sovereign risk are common to many emerging economies. Done correctly, the method and mechanics of India’s low-carbon transition can provide a replicable template for energy development across the world—especially for mitigating carbon emissions, ensuring affordable energy access for all, and eradicating poverty. A study of India also provides assessments and recommendations that can be used in Africa, Latin America, and Southeast Asia. India’s clean energy revolution is more certain now than ever before. The prevailing sense across the political and investor class is that India’s clean energy revolution is more certain now than ever before. In the space of two years, India’s solar and wind energy prices have fallen dramatically, undercutting average coal prices by approximately 25 percent. At the same time, investments in clean energy projects have risen rapidly, with $42 billion flowing into Indian renewable energy projects over the past four years. These optimistic figures, however, should not hide the fact that the lower rates charged by renewable energy power producers are predicated upon two volatile factors: the price of materials and government policies. Prices of renewable energy components are vulnerable to shifts in trade policy, currency depreciation, or changes in supply and demand. Moreover, with renewable power prices dropping, both central and state governments are reassessing the need for incentives and subsidies. 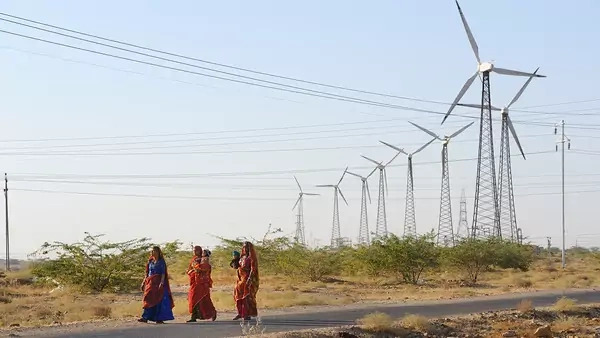 In India, the resulting energy sector optimism over the past few years has skirted over some serious fissures in the foundations of its clean energy architecture. The clean energy revolution in India and other emerging markets has capitalized on the global enthusiasm for a green evolution. However, mood and motivation can only go so far. For those countries to conduct low-carbon transitions in an economically sustainable manner, it is imperative that they address these issues: the fractured financial state of power distribution companies, the lack of developed financial markets, and stringent international financial regulations. The first flaw is the fractured financial state of the country’s power distribution companies (DISCOMs)—an issue affecting other emerging economies such as Nigeria and South Africa. Clean energy producers depend on traditional DISCOMs, so their frailty has a direct impact on the clean energy market. India’s DISCOM problems are related to three distinct factors: poor pricing models due to political interests, weak corporate governance, and ailing infrastructure. Any measure to reform the sector needs to account for all three factors. A significant proportion of Indian DISCOMs have operated at a loss over the past fifteen years. With DISCOMs in financial distress, the possibility of delayed payments or nonpayments to renewable energy producers rises. Even a small delay in payment can be disastrous for power producers who must ensure that their loans and interest payments are paid on time to adhere to debt covenants. If India’s economic conditions become unfavorable, the continued neglect of the DISCOM issue could tarnish the hope of a low-carbon transition for the power sector. Other developing economies may suffer the same fate if they cannot alter policies and compel their DISCOMs to adhere to financial discipline. A second challenge is the lack of a developed financial market in India. Across much of the developing world, the scarcity of debt financing for long-term projects and the poor health of the banking sector can halt the global low-carbon transition in its tracks if international economic conditions change. Debt-financing options for renewable energy projects remain limited within India because the shorter terms of saving instruments inhibit long-term domestic bank loans. Under normal circumstances, this asset and liability mismatch can be bypassed through alternative debt instruments. The use of financial vehicles such as bonds or infrastructure investment funds, however, remains limited in Indian and emerging debt markets. Over the past three years in India, large Indian banks have provided significant funding for renewable energy projects. These loans, however, have largely been driven by macroeconomic factors such as excess capital liquidity (a result of the 2016 demonetization reform), which have largely dissipated. If the Indian banking sector experienced a crisis, domestic debt financing for these projects could quickly dry up. A combination of stringent financial regulations and an oligopolistic credit rating industry have also made it more costly for emerging economies such as India to access international debt markets by as much as 35 percent. Domestic financial institutions are not the only sources of debt financing. International banks provide an attractive theoretical alternative for investors and project developers in India and other emerging economies. Yet, the amount of direct debt financing from international commercial banks for Indian renewable energy projects has been insignificant (below). This phenomenon can partially be attributed to the risk premium that commercial banks charge for operating in emerging economies such as India. These premiums are governed by financial regulations known as the Basel norms; and while it is difficult to identify their effect on sovereign credit ratings, the fact that international banks charged a 2.5 percent “country risk premium” (independent of any currency hedging costs) for renewable energy projects in India suggests a correlation. In practice, the Basel norms perpetuate the misaligned geoeconomic structures that were put in place with the birth of the Bretton Woods institutions. The sovereign credit ratings used to determine risk are the exclusive domain of Fitch Ratings, Moody’s Investor Service, and Standard & Poor’s. These credit rating agencies are all based in the developed world. They have a history of providing incorrect assessments and, most important, are paid by the banks they are assessing. There have been attempts to create a firewall between banks and credit rating agencies, but policies such as the 2010 Dodd-Frank Act in the United States and the 2013 Basel Committee on Banking Supervision have proven to be inadequate. The disruptions caused by sovereign credit ratings go beyond the interest rate increase caused by the Basel norms. Sovereign credit ratings can affect institutional and retail investor sentiment toward corporations that would otherwise be considered financially sound. The best example of this is ReNew Power, India’s largest renewable energy company, which raised a $450 million bond issuance in 2017. The bond was several levels below what was considered an investment grade rating, despite ReNew’s excellent business fundamentals and backing from Goldman Sachs, the Abu Dhabi Investment Authority, and the Green Environment Fund. Since the issuance of the bond, the firm has grown exponentially, cementing its place as one of India’s premier energy producers. In order to fuel a new low-carbon growth model in emerging markets, governments, global industry, and civil society should pursue the following recommendations. Reclaim power grids by implementing hybrid public-private systems. The Indian state of Gujarat is the exception to the country’s DISCOM issues, with all four of the state’s utilities currently showing profits. Gujarat’s path could be a model for other parts of the developing world. The Indian state of Gujarat is the exception to the country’s DISCOM issues, with all four of the state’s utilities currently showing profits. Early in 2002, 20 percent of the power supplied to urban Gujarat was stolen, as was 70 percent of the power supplied to rural areas. A newly elected administration took aggressive steps to contain power theft, including passing new legislation, improving metering infrastructure, and setting up special police stations and courts to deal specifically with the issue. At the same time, the administration took steps to ensure that the State Electricity Board did not bow to political lobbying when deciding electricity rates for the various categories of consumers. The most important step taken by the administration, however, was splitting its feeder systems. In most Indian states, one feeder provides power to rural and urban areas indiscriminately. By splitting the feeder system, Gujarat was able to effectively manage its power supply for agricultural consumers while curtailing the subsidization of electricity for nonagricultural consumers. While the Indian central government (as well as Indian states) have implemented parts of the Gujarat model, none have yet implemented all of them. Emerging and developing countries need to learn that public-sector ownership of the electricity sector and large-scale subsidization of power consumption is difficult to manage. A hybrid system that provides for those most in need, while ensuring that those who have the means to pay are charged appropriately, is a better economic model. This strategy has been successful in the past, and helps alleviate offtake risk in emerging and developing countries—thereby removing one of the biggest obstacles for private capital investment. In many parts of the world, however, such a complex transition might not be possible to implement in the foreseeable future. In these cases, privatization combined with a direct subsidy system would be more efficient than a model based on public-sector entities. Create alternative financial vehicles to increase funding for clean energy projects. Given the complexity of the world’s geoeconomic architecture and the interdependence of banking systems, direct economic interventions designed to bolster debt financing are not always viable. To ensure that debt financing continues to be available for clean energy projects in emerging markets, policymakers can create alternative debt vehicles. One such alternative in emerging economies is the creation of “green” asset-backed securities. Securitized debt has been a largely overlooked financial instrument outside of the developed world, but recent reforms have shown the potential of the asset class in emerging markets. By compiling renewable energy assets that come from different companies and geographies at various points in their operational lifecycles, banks and other financial institutions can counter many of the risks associated with individual renewable energy projects. To further bolster the credit rating of a securitized instrument, the creator of the asset can even add a tranche of non-green assets. The proceeds from selling the security can then be used to finance new projects, which can in turn be securitized themselves, creating a virtuous cycle. Another alternative to traditional debt could be developed through the creation of “green” investment banks (GIBs). GIBs are government-funded entities that enable private investment in low-carbon assets. There are currently twelve GIBs operating around the world. GIBs operate like a normal investment bank, albeit with a sectoral bias. They can provide debt for projects with their existing capital reserves and by raising funds through the issuance of bonds and asset-backed securities. They can also invest as equity partners, developing projects and conducting due diligence, if needed. The value of GIBs comes from their flexibility and ability to adapt to market conditions and trends. Moreover, GIBs have sectoral experts whose skillsets allow them to understand public- and private-sector dynamics and deal with transactions of all varieties. And more important, GIBs are profitable. The British Green Investment Bank and the Australian Clean Energy Finance Corporation have both posted return rates higher than 4 percent in recent years. The Green Investment Bank was profitable enough that the British government was able to sell it to a leading global investment bank, netting approximately $200 billion from the sale. The creation of GIBs in individual countries could create a sustainable and profitable option for renewable energy project developers to turn to outside of the traditional banking systems. As demonstrated by the recent success of securitization in India, it is crucial for financial markets to develop ways to aggregate assets. Indeed, securitization may be the best way for many emerging and developing economies to access both international equity and international debt financing. In addition, investing in specialized sectoral banks can reap large dividends, given sectoral expertise, flexibility, and clustering and leveraging effects. Lift international constraints on climate financing. In the current global geoeconomics system, there is a split between developing countries, which need enhanced credit access, and creditors, which need to carefully manage the effects of relaxing credit restrictions. While the Basel norms have had a significant effect on financial flows from developed to developing economies, central bankers have been reluctant to offer any adjustments based on climate change metrics. To the economists, academics, and other decision-makers who influence international financial regulations, making adjustments to favor green energy over all other sectors is the equivalent of amputating an arm to treat a splinter in one’s finger. Decision-makers need to reconsider the traditional ideas that have governed climate finance and think beyond economics. However, splinters can bring infections that affect the entire body. These decision-makers need to reconsider the traditional ideas that have governed climate finance and think beyond economics. Clean energy is not simply a corporate social responsibility cause. Rather, it is the best chance that the world has to avert large-scale weather variations that will certainly affect all industries and businesses. Basel IV, the proposed reforms for the global banking regulatory framework, should include incorporating climate change in its assessment criteria—either by measuring the susceptibility of a bank’s portfolio to climate change–related damage or by implementing a green factor on the weighting of risk for renewable energy projects. Emerging and developing economies should ensure that their voices and opinions are heard, given the disproportionate disadvantage that the Basel norms impose on them and the consequences many of them face if the Paris Agreement goals are not achieved. Furthermore, credit rating agencies need to either be held accountable to certain standards, with larger punitive measures in cases of failure, or open their oligopolistic industry to new entrants. Sovereign credit ratings should be comparative across the emerging and developed world—Greece just prior to its economic collapse, for example, should not have had a higher credit rating than India. Emerging economies need to unite and adopt alternative international credit rating options if the existing ones continue to show prejudice. The significance of India’s development choices should not be underestimated. If the success of the Millennium Development Goals was predicated on China’s economic rise, India’s capability to replicate the same in a carbon-scarce world will determine the fate of the Sustainable Development Goals. In the process of lifting millions of its own people out of poverty, India’s industrialization pathway may also offer solutions for emerging economies seeking to capitalize on green investments. As the Indian example suggests, passing structural reforms in power distribution and creating a more mature financial marketplace for the renewables sector are a few domestic policy tools emerging economies can employ. Still, rigid global financial norms and opaque credit rating practices will continue to hinder their prospects. Ultimately, both emerging economies and international institutions need to find new and innovative policy tools to secure low-carbon pathways.